The gospel comes to each of us on its way to someone else. God invited us to join in with what He's doing in the people all around us. MissionHub gives you a place to prioritize whoever God has placed in your life, so you can make the most of every moment with them. On the People tab, you will be able to add the people God has placed in your life by clicking the + icon in the top right! 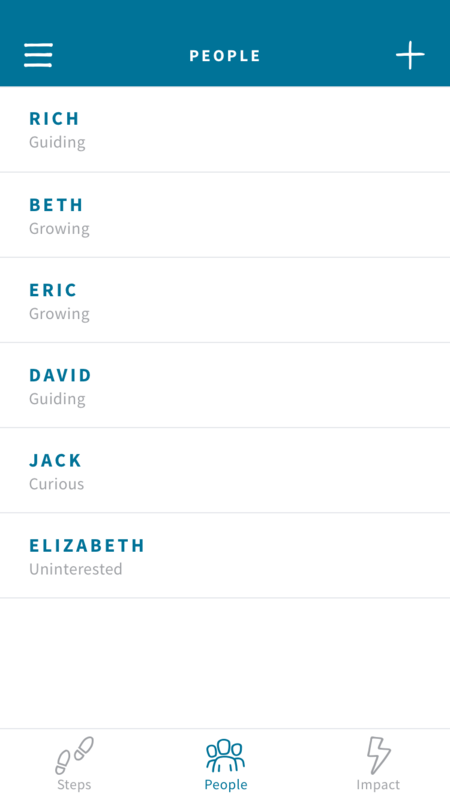 Clicking on a Person's name lets you see a deeper view of your intentional relationship with this person. Contact the person through text, call or email. See a filtered view of your steps with that person (especially helpful if you are discipling that person). Save private notes you don't want to forget about that person. Our Journey with that person - this is memory lane of all the important things you've done with this person. If you had an interaction (discipleship conversation, Holy Spirit conversation) with that person, you can record it here.